When I was about 9 or 10 years old I was watching the musical Annie on video at my grandmother's house. During the opening credits, my aunt made a remark about how she "loved Tim Curry in Rocky Horror". I didn't think anything of it until a few years later, when one of my perverted old school "chums" showed me a film called The Rocky Horror Picture Show that he rented from the local library. 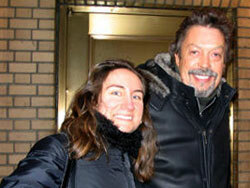 I recognized the name Tim Curry and my aunt's remark. Holy crap, that was the same guy playing Rooster in Annie? It sure as hell was. Seeing Rocky Horror at that the age of 13, I hated it at first to be honest. I felt it was too "dirty" and maybe I shouldn't have seen it. However the one thing that grabbed me from the beginning was the music. It was pretty catchy... particularly The Time Warp. I kind of became fascinated with the character of Riff Raff, dressing up as him to a high school Halloween party several months later. Thus my obsession with the most widely known cult film around the world began. I started buying everything I could get my hands on (which back in the early 90s before the real boom of the Internet, eBay, etc. wasn't easy). I joined the Official Rocky Horror Fan Club after seeing the address posted on that videotape of the film my friend rented. I confiscated all my aunt's old Rocky Horror memorabilia from my grandmother's house including the soundtrack on vinyl, some B&W photos and what have you. As I delved more into the world of the Internet, I was overjoyed to find a "bulletin board" on the old Prodigy Internet service where I ran into the likes of Mark Tomaino from Midnight Insanity, Mad Man Mike from the NYC Cast and became actual U.S. mail pen pals with "Esquire", aka Phil DeJean, through the RHPS Fan Club. It was so great to have other people who loved this film as much as I did and interact with them regularly and ask them questions about the film, where to buy related merchandise and so on. I was "networking" at 14 years old! About a year later I was asked to submit RHPS themed artwork for one of Midnight Insanity's weekly program covers by Mark. I finally saw the film in theaters around 1993 at the old theater on 12th and 2nd Avenue in NYC with my parents... An experience me nor my parents would never forget! We had toast thrown at our heads, confetti, everyone was half naked, you couldn't hear the dialogue in the film because of the audience interaction. It was wild! Later on, while I never became actively involved on the Rocky Horror scene as far as being part of a cast and so forth, I still managed to keep in touch with the Rocky Horror scene and goings-on within it as the Internet expanded and more fan sites cropped up. 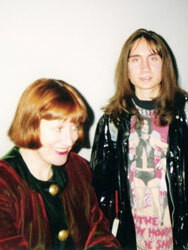 I attended my first convention in NYC in 1998 where I had the honor of meeting Little Nell aka Nell Campbell! If I thought seeing the film in the theater for the first time was an experience, nothing prepared me for the wonderful mayhem that ensued at my first convention! The best part about it all was, however, that everyone seemed to be part of this one big universal family. There were fans from all parts of the globe dressed up as their favorite Rocky Horror characters just having a great time together. Throughout the late 90s and early 2000s, I contributed several articles and pieces of artwork to the incredible, but unfortunately now retired Rocky Horror fanzine, Crazed Imaginations. Not only was this fan publication a wonderful way for me to continue to keep up with the various Rocky Horror events around the world, but it was a great opportunity to get my artwork published and also make some great connections in the fanbase, like editor Ruth Fink-Winter amongst others. Also during the 90s and 2000s, I had the honor and unforgettable experiences of meeting Tim Curry through various outlets, whether it be at a stage door where he was doing a play in NYC, a local appearance at the Museum of TV and Radio, and even on one of his film sets in the UK. 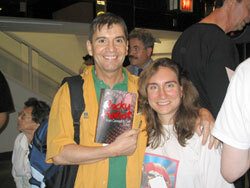 In 2004, I again was thrilled to attend the next NYC convention run by Larry Viezel and company, and meet even more of the wonderful performers from the film, mainly those who portrayed the various Transylvanians like Perry Bedden, Sadie Corre, etc. That convention allowed me to reconnect with some of those early online RHPS contacts I had made as a teenager. I heard more then once that day that they had practically seen me grow up as I was now in my mid 20s, and that meant a lot to me. It also made me realize that even with all the technology now, and perhaps some of the focus on the Rocky Horror "cult" not as strong as in the mid 80s and in the past 10 years even, that there was still this large group of people brought together by a film that played an important part in their lives as it had mine. I was very honored when Bill Brennan approached me to write this month's fan bio because not only is Bill one of my longtime Rocky Horror buddies even though we don't see each other really or talk regularly, it again shows the power that this film has over its fans. That after all these years we DO keep in touch, and even though I was never a theater cast member or ran my own fan magazine, that Bill still felt I was "important" enough to contribute as a long term and loyal fan of the best movie in the world. Thank you, Bill and thank you everyone who I've met that's affiliated with the film and its fandom in some way, and thank you, of course, to Richard O'Brien, who without which I wouldn't be typing this out in regards to his creation that brought people together!